Geoffrey Vernon is an award winning, Sundance Film Festival nominated film composer from Jacksonville, Florida. Geoffrey is known for his score for The Knights of Excalibur. A Veritable force in the Film Industry, Geoffrey Vernon is among some of the top writers for Trailer/Film Music. At only 20 years old, Geoffrey Vernon is one of the youngest composers in the film music industry. His melodic lines mixed with heavy orchestral elements and brooding choirs set him apart from the rest in the industry. Geoffrey's music isn't your average "background music", his music is the music that hits you hard in the face. Geoffrey started his career in the music industry when he started playing piano at around 12 years of age, but eventually gave up because he always wanted to write his own music yet the teacher would not let him. He eventually gave up on piano and started playing guitar. Though his parents thought it was a faze, he stuck with it and ended up in several local Christian bands and Rock bands. Finally at around 14 years old he picked up piano again. Geoffrey had always had a love for film music and trailer music, which led into the forming of what was his first company, Blood Of The Covenant. Blood Of The Covenant was one of the industry leaders in providing high quality music for Film Trailers, TV Spots, and Game Advertisements. In September of 2013 Geoffrey had announced that it was time to call an end to Blood Of The Covenant, and bring it to a close. He explained on his Facebook page “Over the past 2 years as a composer I have learned so many new things, and I need to find a new outlet to provide all of you with fresh music that you’ve never heard before.” Not long after this statement he announced that this new outlet would be “Dark Winter Music”, a brand new Production Music company that would specialize in FIlm Score and Music For Motion Picture Advertising. It was officially announced that Dark Winter was to open in September 2013, and would be run by Geoffrey and his very good friend, and fellow composer Daniel Yount who is very well known in his own rights. Geoffrey's music has been placed in over 20 blockbuster movie campaigns including The American Sniper, Star Trek Into Darkness, 3 Days To Kill, Devils Due, Mamma, Angels and Demons and many more. His music has also been used in TV Spots for Lexus, Mercedes-Benz and Porsche. When he hasn't been writing Trailer Music, Vernon has found additional footing in the Film Music world. 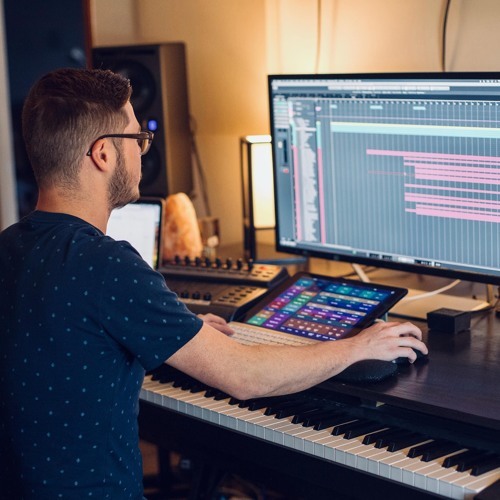 His versatility as a composer has opened up the door for him into scoring multiple projects of multiple different genres. He has 10 independent feature length and short films under his name, 6 of which have made it into the top 5 at the Sundance Film Festival. Geoffrey's unique and powerful scores have won him 4 awards for best original score at the Sundance Film Festival.